In this NewLaunchGuru Insights, I will share with you my thoughts on real estate investment. Is real estate investment really better? Very often customers would ask me a question. Why do you think real estate is better investment compared with other types of investment? And sometimes, people get confused with all the terms which are used to calculate property returns. For example, rental yield, capital gain, return on equity, etc..
Today, let me try to explain in a simpler way by using a easy calculation chart as below. Imagine you are buying a 1M property today. The initial investment you need is merely $300K. Even with 7% ABSD for the 2nd property, in long term, property still will provide you with a very decent return. 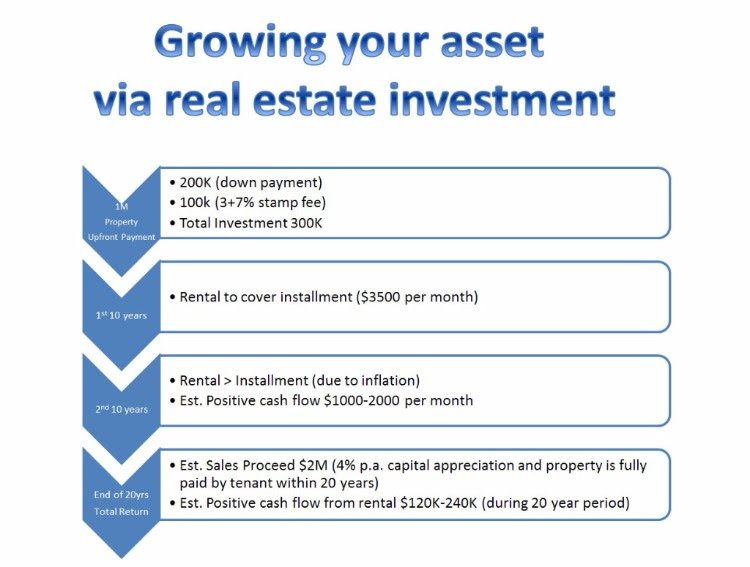 Your $300k is likely to grow over $2M in 20 years time through real estate investment. To me, the beauty of real estate investment is that it's possibly the only asset class that allows you to have a high leverage but with no margin calls. And it's best hedge against inflation. The important characteristic of real estate investing is the ability to place debt on the asset, which is several times the original equity. This allows you to buy more assets with less money and significantly multiply asset value when the price appreciates. For 20% down payment case, if your property appreciates 20% in value, your asset in fact get doubled or you achieved 100% cash-on-cash return. Maybe you are still hesitating is it safe to invest into property now? Record shows that more than 90% of the people still made money even in today's low market. In comparison to stock market, news reported that 85% people in Singapore lose money when investing shares using their CPF money. No one can ensure the future of properties’ values. But this asset class seems positioned to continue to be among the top list in people who wish to grow their assets at faster pace, so that they can retire early and live a happy life thereafter. If you would like to receive 1st hand information on any of the upcoming new Launch projects, OR Want to be invited as VIP customer to preview the show-flat before it opens to public, please contact NewLaunchGuru. Property Price doubling in 2030 remain Intact?